T-Mobile’s Sr. product guy has got some special news to report you. Its about T-Mobile Sony Xperia Z3 launch date. 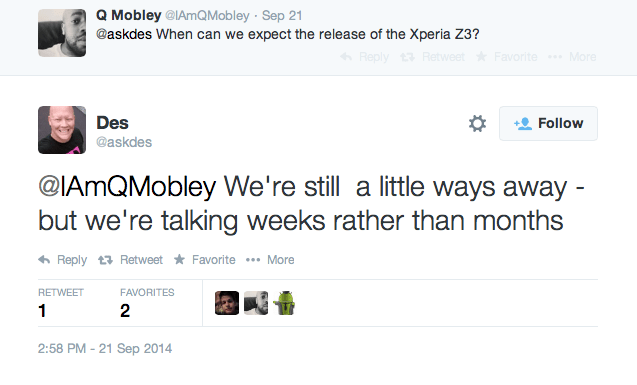 According to him, the expected Xperia Z3 launch on T-Mobile is just few weeks away(no more moth counts). This was reported by his Twitter account named @askdes. There are few people out there who doesn’t want to shift carriers due to the launch of new smartphone devices. So, for T-Mobile customers, its a pretty good news. T-Mobile is lining up a killer hardware portfolio for fall with a selection that gives customers every opportunity to find the perfect device. That’s why today, T-Mobile announced that Sony’s Xperia Z3 will be joining the Un-carrier’s selection of high-end smartphones, available online and in participating T-Mobile stores, this fall.